PaperPort Notes can record audio to include in your documents in order to help you stay organized during meetings or lectures. Step 1:On a page, tap the Audio button. Tap the + button to begin recording. 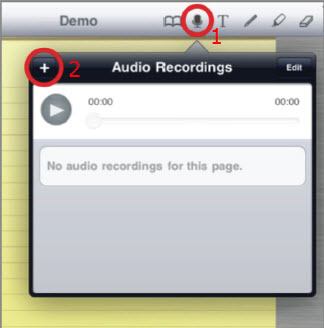 Step 2:When recording, the microphone icon will be red. To stop recording, tap the red microphone icon. It will turn blue. Step 3:If you need to change the page, and you don't tap the red microphone icon, then the recording will automatically stop on the current page and pick up again on the new page. Note: If your document has audio recordings, the ONLY way to SHARE the documents so that the recordings can be heard is via the File folder for the Paperport App in iTunes.